To celebrate the Royal Jubilee the Children's Theatre 2012 production was THE OLD MAN OF LOCHNAGAR - Book, music & lyrics by David Wood. Based on the book by HRH The Prince of Wales. Set in the Highlands of Scotland, the music, colour, humour and drama in THE OLD MAN OF LOCHNAGAR provided a treat for the whole family. The story followed the quest of the Old Man, who lives in a cave by the Loch under the mountain, Lochnagar, to save the Gorms from the menacing Giant Gormless. His quest leads him under the sea, through the air and into Gorm Grotto and features a wealth of eccentric characters, including the Pig Eagle, a grumpy Grouse and a thrace of Loch-Haggis! 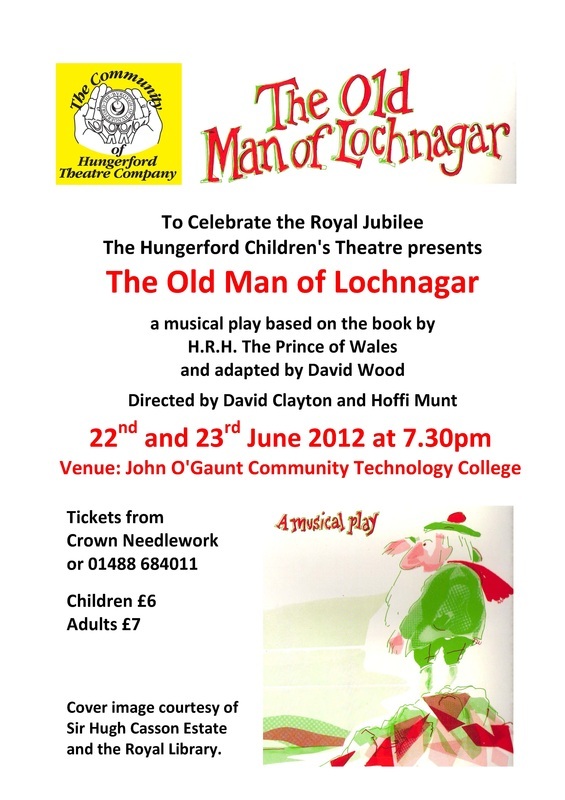 "Congratulations to the cast of The Old Man of Lochnagar a great performance from the talented youngsters and of course the Old Man Himself - John Miles"
"My congratulations and thanks to the talented youngsters. They carried me along on the crest of a wave. :)"